The prep time for this chicken and broccoli casserole is only 5 to 10 minutes, and the flavors are fabulous. 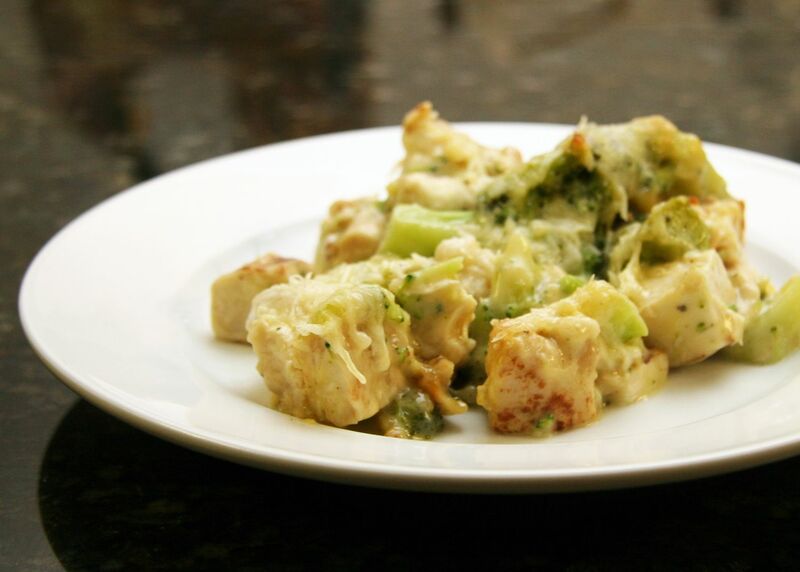 The easy chicken and broccoli mixture is topped with a sprinkling of Parmesan cheese and baked to perfection. If you prefer cheddar cheese, add it to the casserole about 10 minutes before it's done baking. If you don't care for commercial condensed soups, make a thick white sauce with your favorite seasonings. Melt 2 tablespoons of butter in a saucepan over medium heat. Add 3 tablespoons of all-purpose flour and cook, stirring, for 1 minute. Add 1 cup of milk or a combination of milk and chicken broth and continue cooking, stirring, until the mixture has thickened. Taste and season as desired. Use as a substitute for condensed soup in casseroles. Vary the flavors by using part vegetable broth, chopped sauteed mushrooms or celery, or your favorite herbs and seasonings. This is a satisfying macaroni and cheese type of dish made into a whole meal with the addition of chicken and frozen peas. The bacon livens this chicken pasta casserole recipe up with fabulous smoky flavor, and the bread crumb topping adds just the right amount of crunch. Chopped kale adds color and nutritive value to this pasta and chicken casserole. The homemade sauce is made with chicken broth, wine, and heavy cream. If you prefer, omit the wine and use more chicken broth or some milk. Shredded cheese and herbs add flavor, and soft buttered bread crumb topping adds texture. It's a well-rounded one-dish meal your family will love. In this easy chicken rice divan bake, broccoli and cubed cooked chicken get together with rice and a delicious savory cheese sauce. The sauce is made with Cheddar cheese, but any good melting cheese could be substituted. If you aren't a fan of broccoli, make it with frozen asparagus spears or green beans. French-fried onion rings make a crunchy and flavorful topping for this macaroni and chicken bake. Peas and carrots or mixed vegetables are added to the casserole to make it an all-in-one meal. Condensed soup and milk form the sauce for this easy dish. If you prefer a homemade sauce, make 2 cups of basic white sauce with part chicken stock and season to taste. Add chicken bouillon granules to the white sauce for a deeper chicken flavor. This chicken florentine casserole is prepared with layers of spinach, chicken, sliced ham, cream sauce, and Parmesan cheese. The dish is flavored with a variety of herbs and garlic, and the lack of rice or other starch means the carb count is relatively low. The dish is hearty enough to stand alone with a side salad or fresh sliced tomatoes, but feel free to add baked potatoes or rice. This crock pot Swiss chicken casserole is a quick prep (15 minutes) cooks in the slow cooker while you take care of other things. It's a delicious combination of dressing, chicken breasts, and Swiss cheese slices. Serve it with a salad or vegetables for a satisfying family dinner. Condensed cream of chicken soup and refrigerated biscuits add to the convenience and ease of preparation of this one-dish casserole. Most casseroles are very versatile, so don't feel you have to follow the recipe to the letter. Cheddar cheese or Swiss can be substituted for the American cheese, and if you aren't a fan of mushrooms, leave them out. The dish calls for green beans, but mixed vegetables, peas, or frozen carrots can be used instead. This chicken casserole can be made with mini penne, macaroni, or similar pasta. It's made with an easy condensed soup sauce, sour cream, mixed vegetables, and Parmesan cheese. This chicken and biscuit bake is homemade. The filling is made with cooked and diced chicken breast halves, a cream sauce, and peas, and the homemade parsley biscuits make up the topping. The biscuits are very easy to prepare, and they can be made ahead of time and frozen raw. Just put the frozen biscuits on the casserole just before you bake it. This easy layered casserole is loaded with flavor and sure to please. A homemade white sauce and taco sauce bring the ingredients together. Plan to refrigerate the casserole for a few hours before baking for best flavor. Liz's simple chicken and rice dish are baked to perfection with a topping of shredded cheese. Add a side vegetable or salad for a complete, satisfying meal. It's made with just four ingredients, water, and some basic seasonings.